DIAMOND BAR, Calif.--(BUSINESS WIRE)-- Biosense Webster, Inc., a worldwide leader in the diagnosis and treatment of cardiac arrhythmias, announced today that it has received approval from the United States Food and Drug Administration (FDA) for its THERMOCOOL® SMARTTOUCH® Catheter. This device is the first therapeutic catheter approved in the U.S. that enables direct and real-time measurement of contact force during catheter ablation procedures for patients suffering from drug-resistant paroxysmal atrial fibrillation (Afib), sustained monomorphic ischemic ventricular tachycardia and Type I atrial flutter. Providing doctors with contact force stability when applying radiofrequency energy (RF) against the heart wall during catheter ablation has been shown to improve outcomes as inconsistent tissue contact may result in incomplete lesion formation that could result in the need for additional treatment, and too much contact may result in tissue injury, which may lead to complications. The THERMOCOOL® SMARTTOUCH® Catheter enhances a physician's ability to achieve stable and consistent application of contact force by providing direct, real-time quantitative feedback graphically displayed on the company's CARTO® 3 System upon tissue contact. Without this technology, catheter tip-to-tissue contact has to be estimated through other indirect measures such as electrogram parameters and impedance but they have been shown to be poor predictors of contact force. 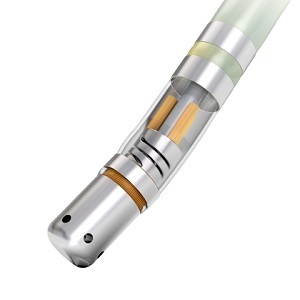 "The THERMOCOOL® SMARTTOUCH® Catheter is an important new device that will benefit the electrophysiology community, as it will enable us to more precisely control the amount of contact force applied to the heart wall when creating lesions during catheter ablation," said Andrea Natale, MD, Primary Investigator of the SMART-AF Trial and Executive Medical Director of the Texas Cardiac Arrhythmia Institute at St. David's Medical Center in Austin, TX. "Data from the SMART-AF Trial demonstrated that consistent and stable application of contact force has a significant impact on patient outcomes. The use of contact force-sensing technology has emerged as a critical tool in delivering optimal outcomes in the treatment of patients with atrial fibrillation and represents a major advancement for the clinical community." The safety and effectiveness of the THERMOCOOL® SMARTTOUCH® Catheter were evaluated as part of a prospective, multicenter study called the SMART-AF Trial in patients with drug-resistant symptomatic paroxysmal atrial fibrillation. One-year results from the trial showed that patients experienced a 74 percent overall success rate after treatment with the THERMOCOOL® SMARTTOUCH® Catheter. Importantly, data from the trial showed higher success rates the longer physicians stayed within a targeted contact force range, with one-year results demonstrating an 88 percent success rate when physicians stayed within a targeted range greater than or equal to 85 percent of the time. The trial demonstrated for the first time that it is the consistent and stable application of contact force on the heart wall that positively impacts the efficacy of the procedure in this patient population. "We are pleased to be able to introduce this important advancement to help clinicians enhance the quality of care they deliver for the thousands of U.S. atrial fibrillation patients in need of alternative treatments to drug therapy," said David Shepherd, Worldwide President of Biosense Webster. "The burden of atrial fibrillation on quality of life, morbidity and mortality is well-documented and we are committed to developing life-enhancing therapies to continue addressing unmet needs in this space." Atrial fibrillation, or Afib, is the most prevalent heart rhythm disorder and is a leading cause of stroke among people 65 years and older. An estimated three million people in the U.S. and 20 million worldwide are affected by Afib and its prevalence is projected to increase significantly as the population ages. Afib is a progressive disease and increases in severity and frequency as patients get older. Left untreated, it can lead to heart valve disease, sleep apnea, chronic fatigue, congestive heart failure and stroke. The public health implications of Afib are a growing concern because those with Afib are at an increased risk of morbidity and mortality as well as a reduced quality of life. It is estimated to be responsible for 88,000 deaths and $16 billion in additional costs to the U.S. healthcare system on an annual basis.2 During catheter ablation, doctors insert a therapeutic catheter through a small incision in the groin where it is then weaved up to the heart through a blood vessel. Once it reaches the left upper chamber of the heart (atrium), radiofrequency energy is delivered to the heart wall to create lesions that block faulty electrical impulses that can cause heart rhythm disorders. Biosense Webster, Inc. is the global leader in the science of diagnosing and treating heart rhythm disorders. The company partners with clinicians to develop innovative technologies that improve the quality of care for arrhythmia patients worldwide. Biosense Webster is part of the Johnson & Johnson Family of Companies. More information can be found on www.biosensewebster.com. Dr. Natale is compensated for his services as a member of the company's scientific advisory board and provides other consulting services. Nakagawa H, Kautzner J, Natale A, et al. Locations of high contact force during left atrial mapping in atrial fibrillation patients: electrogram amplitude and impedance are poor predictors of electrode-tissue contact force for ablation of atrial fibrillation. Circ Arrhythm Electrophysiol 2013;6:746-53.